Home-converting a car to electric power would be so easy were it not for all those inconvenient drivetrain parts you have to remove. It's like carmakers didn't think of what people might want to do with their cars--engine, gearbox, exhaust, filters, fuel tanks--they're all just lumps of metal getting in the way of a proper powertrain. A new offering from GM could change that, however, as Chevrolet Performance starts to sell full Camaro rolling chassis for $55,000. We promise this isn't an April Fool joke. Though we are being economical with the car's true purpose--the Camaro shells are actually aimed at drag racers, whose first job is often similar to that of the electric car home-builder--junking most of the standard drivetrain. As such, reports Motor Authority, each white-painted car features an NHRA-approved roll cage and racing seats--but the rest of the car is remarkably intact, with standard production glass, headlamps, tail lights, door panels, carpeting and more. Externally, the rolling chassis gets NHRA-approved suspension, Bogart racing wheels and Hoosier tires. The rest is pretty much up to you. Most will fill it with a hundreds of horsepower V-8, drag racing transmissions and hit it with a funky paint scheme--but to our eyes, there's little stopping you filling all that empty space with a potent electric drivetrain. 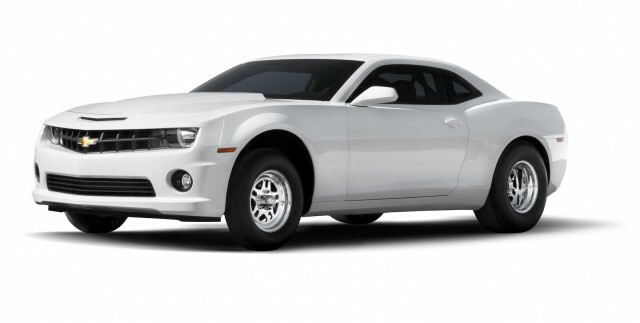 $55,000 is quite a sum for a car with no motive power, but as Motor Authority suggests, it'd cost a lot more to buy a regular Camaro SS for $33,000 and prepare it to the same standard--not to mention the hours you'd spend stripping it down. It also has us wishing that more companies offered rolling shells for such projects--a little cheaper hopefully, but similar in concept. Simply pick a rolling shell from your favorite carmaker, grab an off-the-shelf electric drivetrain, fix it all together and voila--your own brand-new electric anything. What modern car would you like to convert? Leave your thoughts in the comments section below.